If you liked my previous post about the Marvel Cinematic Universe, I hope you’ll enjoy this follow-up blog post! In this post I’ve put together some charts in Data Studio looking at the critical ratings and box office gross of the Avengers franchise and other Marvel Cinematic Universe movies. Below is the Data Studio report, and then I’ll show you how to add some of the charts, as well as looking at some new Data Studio features. So for the first chart we can make a regular bar chart. But a new feature is being able to enable sorting for the chart. This allows us to manipulate the chart to reorder the bars. But to see the options for manipulating and sorting the chart, we need to make sure the Chart Header is visible. To do this, go into the Style tab of the chart and select that the chart header is always shown. Now the chart header should be visible on our bar chart. Click on the A-Z sorting icon on the top right of the chart. As you can see, we are able to sort by different dimensions and metrics. A downwards arrow indicates that it will sort in descending order, while an upwards arrow shows it will sort in an ascending order. Below is the chart sorted by box office gross in descending order. And below is the same chart sorted by film title in ascending order. This allows us to have a single chart that can be used for multiple purposes in the report. I’ve discussed how you can use the new hierarchy feature for geo-maps in a previous post. In this example I’ll show you how to use it for a bar chart. The chart below shows the average box office gross for each main character in the films. For the three Avengers films “The Avengers” count as the main character. I’ve set up the chart data like this. Note that the Hierarchy feature is turned on and I’ve listed Film under Main Character. So let’s say we want to see a breakdown of the Iron Man films. We can use the chart header (or right click) and choose to drill down into the data. 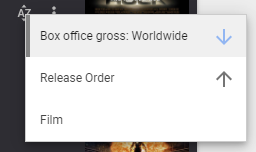 We can then see box office gross of each individual Iron Man movie. So that’s a run-down of some of the new features in Data Studio and how you can add them to your reports. If you liked this article you might like my other blog posts.